The Catholic Church in Qatar is part of the Universal Church whose spiritual head is the Pope. On May 31, 2011, according to a decree of the Holy See, Qatar was detached from the Apostolic Vicariate of Arabia and included in the newly-formed ecclesiastical territory of the Apostolic Vicariate of Northern Arabia. The Apostolic Vicariate of Northern Arabia is under the spiritual care and guidance of His Lordship Bishop Camillo Ballin, MCCJ. The Constitution and laws provide for freedom of association, public assembly, and private worship, within limits based on public order and morality concerns. The law forbids discrimination based on religion. The law prohibits proselytizing by non-Muslims and restricts public worship. The state religion is Islam. The Roman Catholics number around 200,000 to 300,000. Christian group worship is permitted among the six registered Christian denominations at a government-provided area in Mesaymir, on the outskirts of Doha, on land donated by Emir Hamad bin Khalifa. Construction of the Interdenominational Christian Church at the "Church City" complex in Mesaymir was completed in 2009, and the complex was inaugurated in March by Abdullah Bin Hamad Al-Attiyah, Deputy Prime Minister and Minister for Energy and Industry. In his speech, he said, "This church is a sign of a possible dialogue between the different faiths. The church sends a positive message to the world." Before its inception, Catholics used to pray and worship in makeshift "chapels" - homes and a school. Following the Iranian Revolution, the practice of non-Islamic religions was prohibited in Qatar. Finally, in 1995, the new Emir, Hamad bin Khalifa Al Thani, granted freedom of worship, and other priests could enter the country and assist the parish priest (Father John Vanderleen), who until then had maintained a very low profile. Thereafter, the house of Father John the American Priest who was a teacher at the American school, also served as a chapel. When his house was demolished to make room for the Olympic village, the Catholic community managed to rent a large villa as a residence for the priests. The villa had ample land around it, large enough to construct a building for about four hundred people. Finally there was a proper church, though not an officially permitted one! It was called “the chapel”, because of its size and because it was temporary. An office and classrooms for catechism were later added to the chapel and, finally, the Grotto of Our Lady of Lourdes. Our Lady of the Rosary is the first Catholic church in Qatar. Vatican Radio said the opening of the church in Qatar was "an event of historical importance after 14 centuries." The church which has a beautiful interior is saucer-shaped. The exterior has no cross, bell, steeple or signboard. 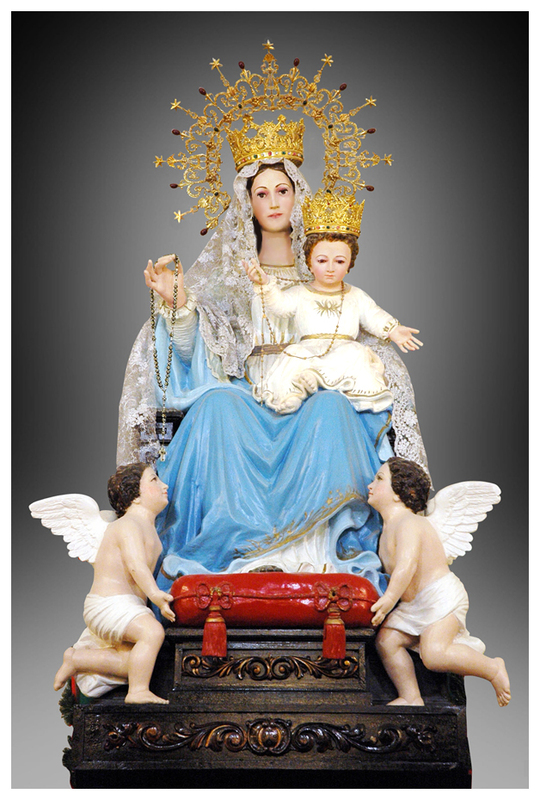 On March 14, 2009, the church was consecrated and dedicated to Our Lady of the Rosary, during a ceremony that was celebrated by H.E. Ivan Cardinal Dias, then Prefect of the Congregation for the Evangelization of Peoples and concelebrated by H.L. Bishop Gremoli, the two Apostolic Vicars of the Arabian Peninsula, Bishop Paul Hinder and Bishop Camillo Ballin, and the clergy. Around 15,000 faithful attended the inauguration Mass and consecration ceremony. The Cardinal thanked "God and Qatar for this great gift of the church." On the occasion, he offered to the church a chalice sent by Pope Benedict XVI. The church is equipped to hold around 5,000 people. On the premises, there is also a parish building (with many halls for catechism and other activities), a rectory, a library and a cafe. The parish is administered by Priests of the Order of Capuchin Friars Minor - the Order that has been entrusted with the Jus Commissionis (pastoral responsibility and authority) for the Vicariate. Qatar established diplomatic relations with the Holy See in 2003. The current Emir has been praised for his religious tolerance and support of inter-religious dialogue, despite keeping a firm eye on Islamic law.